It’s important to protect our system from virus to safe guard our precious data which is available on our PC or on our Internet activity. Because these days hackers are managed to steal our data with various activity without knowing to our knowledge. So it is recommend to use some good antivirus. Good antivirus means it’s better to go some standard and premium antivirus which is available on the net. BitDefender is one of best, standard and Top antivirus company in the Antivirus field. BitDefender is not having any free antivirus product, all BitDefender Antivirus are premium products so you need to pay to start using it.But here is giveaway running by official BitDefender Twitter account where you can get “BitDefender license” Key (Genuine) for 1 Year. BitDefender official Twitter account recently announced in this twitter timeline that they are giving away a Genuine BitDefender Serial Key to twitter users. Wait… to get BitDefender key you need to do some small task. tweet and win! 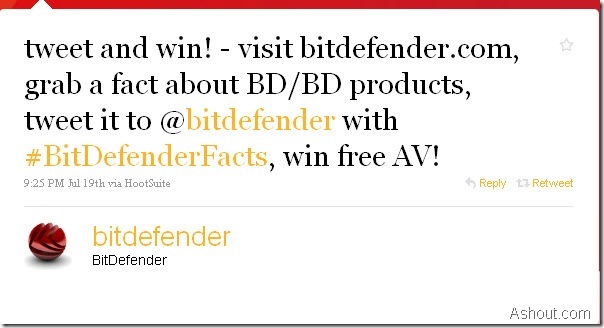 – visit bitdefender.com, grab a fact about BD/BD products, tweet it to @bitdefender with #BitDefenderFacts, win free AV! According to there tweet, they said that we need to tweet some fact about any BitDefender products. Just tweet some cool fact about their product by mentioning @bitdefender with a hash tag #BitDefenderFacts to be the part of that contest. Tip: Fact about BitDefender products means you can tweet cool feature of any BitDefender product. You can get feature about BitDefender product on their BitDefender official website. For Example: I love BitDefender internet security 2010 so I visited BitDefender internet security 2010 product page and chosen one cool feature about that product. @pkarunkumar thanks~! dm your email for your key! This not a giveaway this is contest, they choose few people who they link their tweet. But In my opinion they are providing free and genuine BitDefender license key for all of them who are tweeting about there BD products. Don’t miss this opportunity, get your free and Genuine License Key of BitDefender antivirus. If they chose you as one of the lucky guy, then you get a tweet mentioning your twitter handle to DM your email ID to BitDefender account. BitDefender License: Winner will get the BitDefender License Key on Friday. Still waiting? No… go and tweet about BitDefender and win BitDefender license spreading about good things is not a bad task. Tweet and win it. Last Date to participate: They have not yet announced the closing date, but I guess it may be close on this coming Friday i.e on 23 July 2010. Thanks for sharing and perfect instruction how it is done in this contest. Thanks for the full information. No thanks though, BD. I won’t be using my Twitter account to spam my loyal followers. If BD Products are feeling the heat from not having a free version of Bitdefender for home use, then maybe they should consider having one, rather than trying this no-class advertising ploy that will devalue my feed. I don’t think you will spam doing so, because even your followers get information about this contest. it also scan hidden files!!! !